Get With the Flow 2.0! July 7, 2018, just after 6 pm. Mackensi Emory was tired — and justifiably. She had just come from a day of competing, having just won the NASKA (North American Sport Karate Association) Double Overall Grand Championships for Women’s Forms and Weapons. However, the biggest performance of the night — of the entire season, in fact — was still ahead of her: the International Sport Karate Association (ISKA) Night of Champions. The Night of Champions is the premier sport karate event in the world. It’s held at the close of the U.S. Open tournament, which draws thousands of competitors from around the world and nearly 10,000 spectators. The Night of Champions itself is a sport karate showcase featuring the best of the best, and it is broadcast to the world on ESPN-TV, the distinguished all-sport’s network. Emory had been invited to compete for the Night’s Forms and Weapons title. The previous year, she had dropped in the weapons division at the same event. Although she had still ended up taking the forms world title, she was eager to show the judges and audience alike how hard she’d worked in the year since to improve. Her fingers shifted around the handles of her kamas. She felt ready. The checkered grip-tape wound around the center had started to feel sweaty, and she took a moment to set the weapons down and brush her palms over the pants of her uniform. She glanced at the clock. Twenty minutes left until she took the stage. She shuffled through her bag, and popped on her headphones to zone in. As she listened to her favorite songs, she closed her eyes and pictured every detail of her forms, down to the smallest motion. She imagined the timing of the moves flowing along to the beat of the music. I know this, she told herself. I can do this. The energy from the crowd was simultaneously energizing and calming. It snapped her mind back to the performance at hand, throwing images of moves and forms into crystal-clear focus. At the same time, it yanked the nervousness away. To get to be here, now, on this stage — it was truly amazing and humbling, Emory felt. The crowd and their cheers faded from her mind. She saw only the lights, and heard only her music. Not spitting, tinny, from earbuds this time, but reverberating through the building’s sound system. She flowed with the beat through her forms, the golden-handled kamas glinting as she spun them up, up, up. As she completed the final piece of her form and the music ended, she stepped back into reality. The crowd came back into view, along with her fellow Team Paul Mitchell members and coaches, all grinning and giving her enthusiastic applause, standing on their feet. Emory was smiling, too. She’d hit every move perfectly, and had just shown a year’s worth of work. In her mind, she’d already redeemed last year’s loss, but the success of this performance, as well as her other wins that weekend, didn’t make her want to rest and celebrate. Her hard work paid off. She ended up taking the ISKA Weapons win, and followed it up by also winning the Women’s Forms ISKA title as well. It spurred Emory to a new love of sport karate, and she became even more determined to pursue her passion. But she didn’t just want to win for herself. Like many high-level martial artists, Emory had become determined to share her art with anyone who wanted to learn, and inspire as many people as possible. Emory is no stranger to teaching martial arts. “I was asked out to go to Russia at the end of 2013. Since then, I’ve had the opportunity to travel to many places with different groups to teach and perform. That jump-started it for me, and that’s when I fell in love with teaching. It came naturally to me because I simply love sharing my passion with others. And I love knowing that my teaching, or even a performance, could inspire someone to want to become a better version of themselves. This selfless love of the sport must have been evident in not just Emory’s enthusiasm but in the quality of her teaching. As of the publication of this article, Emory has taught multiple seminars in the U.S. and abroad, including in Ireland, Spain, Guatemala, the Netherlands, Hungary and Australia. It might have seemed like Emory had advanced as far in instructing as she had in competing. But any martial arts competitor who wants to stay at the top of the circuit will tell you that it’s not enough to be good — you have to constantly look for ways to get better. As a dedicated teacher and proponent of martial arts, Emory was similarly always looking for ways to spread the arts to more people. That opportunity arrived, by surprise, at the 2018 Martial Arts SuperShow, where members of Team Paul Mitchell, including Emory, were performing and giving demos. 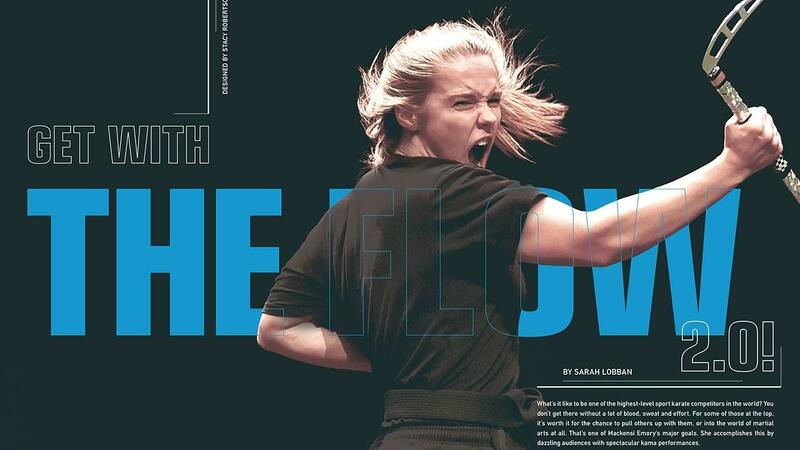 For those unfamiliar with the term, The Flow System is a complete weapons-training curriculum launched by MAIA in 2018. The first curriculum featured Jackson Rudolph, another Team Paul Mitchell Karate superstar, and bo (staff) training. One of the defining features of all The Flow System that sets it apart from other curricula is that it is designed not just to teach students, but instructors as well! Each curriculum features a section for instructors, giving them the ins and outs of how to teach, what common pain points for students will be, and how to break down explanations in ways that can be understood by all students. Even if you’ve never taught a weapon’s class before, The Flow will allow you to start one! For students, The Flow features every tool needed to master the kamas: complete forms, at-home practice routines, various drills and more. Emory also incorporates special tips that she’s picked up over her years of competition. School owners who sign up for the Flow Program will also have access to a private Facebook-based support group, made just for them! In this group, they’ll be able to contact Emory directly with questions, and receive tips and advice from her and other Flow members. Want to get first-hand experience in The Flow curriculum? Both Mackensi Emory and Jackson Rudolph will be at the 2019 Martial Arts SuperShow, this June 30th through July 3rd, at the Bellagio Hotel in Las Vegas. They’ll be teaching a preconference event, as well as holding a workshop during one of the Show days. Attendees will have the chance to train with them while learning more about how to bring a popular weapon’s program to their own schools! This isn’t an event to miss out on, so go online to MASuperShow.com and book your tickets now. This wasn’t Emory’s first time to collaborate with MAIA and its equipment/supply arm, Century Martial Arts. In early 2018, she had released her line of Signature Series Kamas with Century. These kamas, made to her specifications, are the same kind she has long used in competition (including the Night of Champions) since she started kamas in 2009. It was the first time she’d had the chance to create a weapon’s curriculum on such a large scale, and introduce it to an audience. Naturally, she leapt at the chance. She also points out that the program isn’t just for beginners. How many other sports can you find where the highest-level active competitors are willing to not only share their signature moves, but readily offer in-depth training on how to do them? Emory is clear: For her, martial arts is about more than winning competitions. Mackensi Emory’s Flow System kama curriculum was just released in February, 2019, and it’s already picking up steam. Of the schools who have tried it, chances are, most of their students are still new to kamas to have been seen on the tournament circuit. But one day, they’ll be able to show their skills in a competition or even help teach others in their own martial arts schools. To learn more about the Kama Flow Curriculum, go here!